The importance of getting good sleep can't be overemphasized. Though opinions vary on how much sleep we need, there's no doubt you must have decent rest to be in good working order. Your body needs sleep to repair itself. Your mind also needs the time of quiet and rest that sleep brings in order to function during the coming day. And, if you're looking for stress relief, you better be sure you're getting enough shut eye. Unfortunately, many people have difficulty sleeping. Sometimes this is due to physical problems, and other times it's due to mental stress or anxiety. In any case, essential oils can be a great help when it comes to getting the sleep you need. The main way essential oils help with sleep is that they promote relaxation. And because of the way oils work, they can help you to relax quite quickly. My favorite oils when it comes to relaxation are lavender and a blend called Peace & Calming. I can count on them to put me in a relaxed state. Lately, I've enjoyed diffusing with the blend Stress Away as well, which has a vanilla and lime aroma that's very comforting. When you are able to relax, you're able to not only fall asleep more easily, but also enjoy deep, sustained sleep. You're more likely to experience what is known as REM sleep, too. This stage of sleeping is necessary to restore your energy and sharpen your mind. We use essential oils in several ways to promote the restoration we need through sleep. The most basic is to apply them directly to the body. The chest and the bottoms of the feet are excellent places to apply essential oils. The reason for the feet is that essential oils are quickly taken up by the body through this location. Another way to benefit from essential oils while sleeping is to apply them to your bedding—especially on your pillow. Try this simple technique... just rub a drop or two of oil -- like lavender -- on your hands and then rub your hands on your pillow. This easy approach can do wonders to help you fall asleep—and stay there. Be aware: some essential oils -- like Peace & Calming Blend -- have a color to them and may potentially stain a pillow case if oil drops were to fall directly on it. Probably my favorite way to encourage a good night's sleep with essential oils is with an essential oil diffuser on the nightstand. A diffuser is a small piece of equipment that disperses essential oils in the surrounding area. 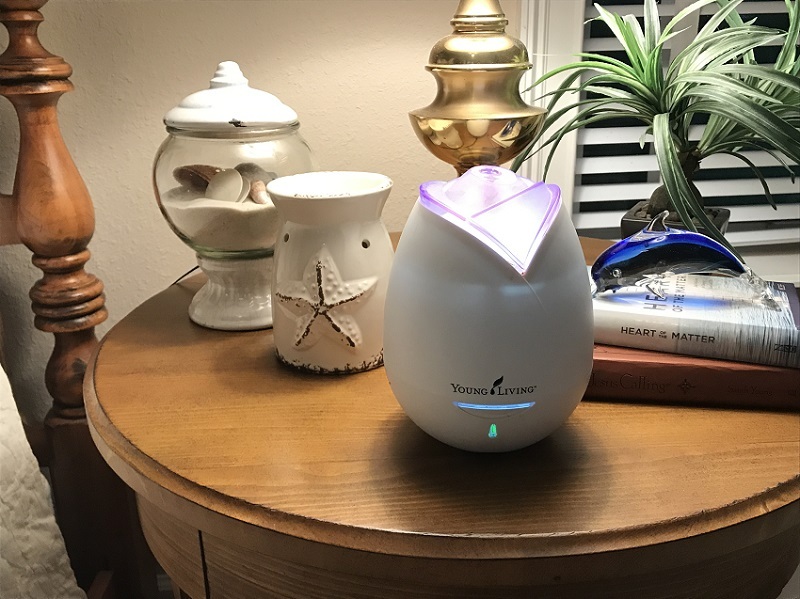 The use of a diffuser is the best way to continually breathe in the calming properties of essential oils through the night. Using a diffuser while you sleep can be an especially good idea if you are trying to do all you can to stay well. That's because the deep breathing that takes place during sleep allows you to take the oils in for hours while you rest. It's for this reason, I make it a practice to diffuse the blend Thieves in my children's rooms during the winter months while they sleep. It's a great way to help them maintain their health. We use a diffuser for visiting guests too—and they love it! Here's another couple of quick ideas about essential oils and sleep that pertain to children. Children are known to have a rough time falling asleep now and then, but essential oils can really be a big help with this problem. This is true both when a child is just restless, or when he or she is not feeling well. I recall a time when one of our sons was so uncomfortable from not feeling well that he couldn't get to sleep. To help him, I rubbed a couple of drops of the blend RutaVaLa—which is a combination of Ruta, Valerian, and Lavender—on each of his feet and it help him to relax so he could sleep. Also, if you would like your children to experience the benefits of essential oils after they've already fallen asleep, here's a little secret... All you need to do is lift the covers on their bed and rub an oil blend like Thieves on their feet, without even waking them up! Overall, we've found the role essential oils can have with sleep to be so beneficial that they're part of our nightly routine.